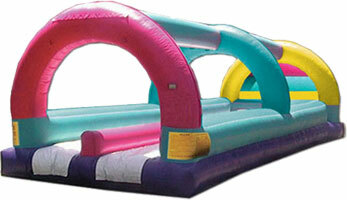 Bounce Surf & Slide – Double Lane! This water slide is being called the “Ultimate Slip n Slide”. Like the Slip n Slides that kids have been growing up with for years, this bounce ride takes the concept to a second level! This Surf & Slide bounce ride has two 30 foot lane sliding areas accompanied by water misting jets from the top of the slide! Call Shaughnessy Rental today for availability!